During a kitchen remodel, lighting usually comes at the latter end of the design. But this in no way diminishes the importance of lighting in your kitchen. These layers not only provide utility (hello, task lighting) but they will help create a mood that invites social interactions. You will find that some light fixtures can act as one or two of these types of lighting. For example, a pendant light over your kitchen island, depending on the bulb and light shade, can act as both a task and decorative light. Task lighting is a necessity. This is the lighting that will help get the cooking completed, help you meal-prep in the early morning hours and light up those small print recipes out of your favorite cookbooks. Important locations include underneath your cabinets and lighting over the kitchen island. Ambient lighting is where the modern kitchen starts to take shape. With the kitchen acting as a major social hub in the home, this lighting offers warmth, inviting gatherings and those important family moments. Ambient lighting can take the form of flush-mounted ceiling fixtures or pendant lighting over the island. With the ever-popular open floorplan, ambient lighting will also ensure that this lighting will fit in with the design of the rest of your home. Ambient can also be a dual functioning light. For example, under-cabinet lights are an ambient/task light providing a glow to the room, but also offer utility; especially, if you are grabbing a late-night glass of milk in the middle of the night. 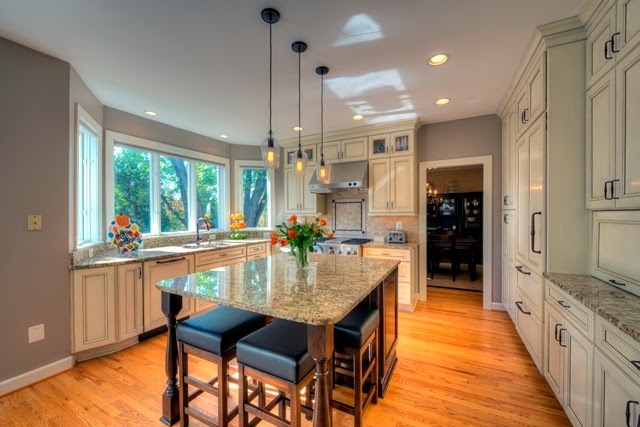 A great example is the kitchen remodel in Herndon, VA featured in the picture above. Accent lighting will give the kitchen a sense of depth and dimension. It is perfect for entertaining purposes by “accenting” your décor. This light could accentuate artwork or a decorative feature in the room. Examples of accent lighting are walls sconces and track lighting. 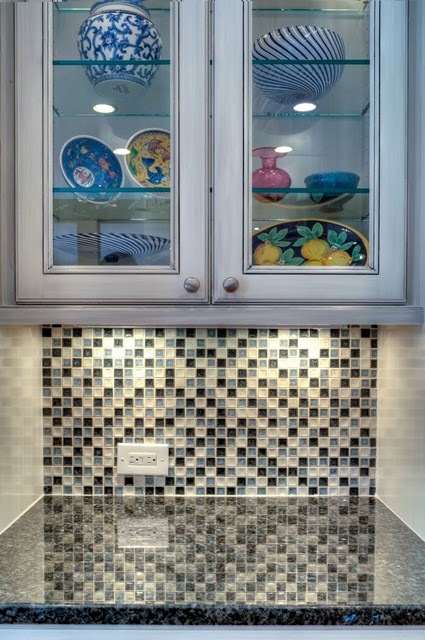 Another way to incorporate this layer is through lighting inside a glass cabinet. This allows you to show off your fine china which is a possibility for this kitchen remodel seen below located in Oakton, VA. Decorative lighting equals drama. 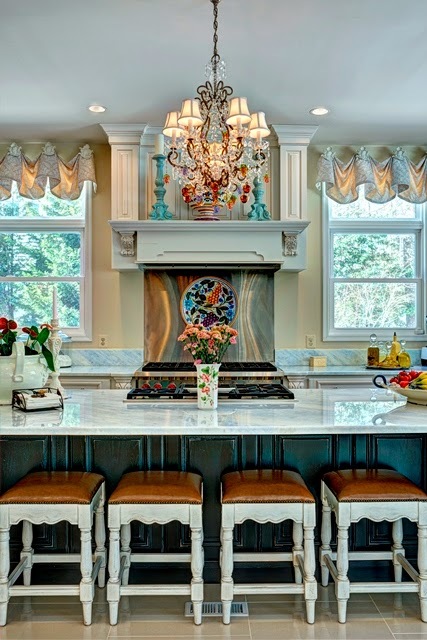 Think chandeliers and eye-catching features like this chandelier from a kitchen remodel in Fairfax Station, VA seen below. What will be important to keep in mind with this type of lighting is the placement in your room as well as the size of the fixture. This is because the fixture needs to balance your room and not overwhelm it because of its placement or because its size doesn’t fit the space. Together, these types of lighting complete every need in your kitchen. Through task lighting, you ensure that the kitchen fits its number one function. Ambient lighting is warm: inviting family and friends to come together and enjoy the space. Accent lighting provides depth to the room by highlighting aspects of the kitchen. Decorative lighting is the final pop of design. No matter the size of your room, there is enough space to create these layers and, if you have a smaller room, it may involve combining some fixtures to make sure you have all four layers. Moss Building & Design is partnering with Dominion Electric for a Girls Night Out event on Thursday, April 23rd from 5:30 PM-7:30 PM. Come meet us at the Dominion Lighting Show Room located in Chantilly where we’ll present our HandyMOM 101 workshop, “Caulk It.” We’ll also be giving away some great prizes with Dominion to celebrate their 75th anniversary! There's still a little time to sign up ..... find the invite link on our website.